The purpose of this video is to powerfully demonstrate endodontic treatment techniques you can utilize to consistently shape canals and three-dimensionally clean and fill root canal systems. 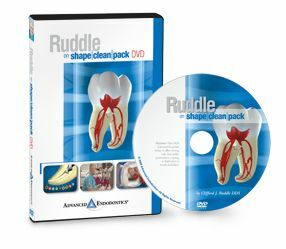 Techniques are demonstrated utilizing 3-D graphics and animation, extracted teeth and operatory patients. All procedures have been performed to optimally transfer knowledge and maximize your learning experience. Appreciate how pulpal breakdown, disease flow and root canal systems impact the restorative practice. "Ruddle on Rotary" techniques allow you to safely and efficiently shape canals with emphasis on internal and external anatomy. Learn the 3-step endo exam, how to identify pulpally involved teeth, and find the “pot of gold”. Visualize how fluid activation encourages debridement and disinfection. Cleaning root canal systems promotes 3-D obturation. Achieve complete, straightline access to all orifices and create the opening for canal preparation. Step-by-step techniques demonstrate how to predictably fill root canal systems using warm gutta percha methods. Learn how to sequence the prep, establish working length, and consistently manage the glide path. Appreciate the importance of achieving the “rest of the seal” and how to properly finish successful endodontic treatment.